This description could start by a long list of technical improvements of Panasonic batteries. thanks to which they gained a stable place on the top of development in this segment (AGM, expanded positive grid. additives for regeneration from a deep discharge, self-extinguishing container material,…). ● batteries can be recharged by several ways, but one of the most reliable belongs a „constant voltage/ limited current“ method, i.e. observing max. 2.45V/ cell and a current limitation. It responds 14.7V at 12V battery and a max. current of 0.4CA. This is suitable at so called cycle usage. ● at a stable connection to a voltage source, a voltage per cell shouldn´t exceed 2.3V what is 13.8V at 12V battery. Current limitation should be set to 0.15CA. ● number of cycles (thus a battery lifetime) is very strongly dependent on a level of discharge before consequent recharging. Dependence is so strong, that for example at discharging to 50% a standard battery will reach a lifetime of approx. 500 cycles, while when discharged in 30% (remains 70% of capacity), the number of cycles will increase up to 1200 (!). The result is, that a choice of a suitable capacity is a key to reach a good lifetime in a given device. Especially in devices, where a battery is daily discharged/ recharged, can a suitable battery (with a higher capacity) significantly prolong a lifetime (thus minimizing costs for replacement). ● if possible, avoid usage of battery on 100% discharge (so called deep discharge). Even though Panasonic batteries manage these statuses and they contain additives for a successful recovery from a deep discharge, but such a usage shortens battery lifetime significantly (to approx. 200 cycles). ● real capacity of a battery (amount of energy, which we´ll get out of it) is strongly dependent on a discharge current. 100% capacity can be reached at a current of 0.05CA/ 20°C. At 0,25CA current it is approx. 75% of capacity and at a current of 1CA it is only approx. 55%. This fact also says for a sufficient sizing of a battery. Especially in applications with a relatively higher power consumption (approx. >0.05CA) we´ll gain by using a 50% bigger battery a resulting battery, with a capacity “increased” in more than 50% (thanks to a relatively lower load of such battery at discharging). Resulting relatively lower discharging current and a lower depth of discharge in every cycle will significantly contribute to a longer lifetime..
● real capacity of a battery also depends on temperature. Difference between a capacity at +20° vs. -10°C is approx. -25%. ● cut-off voltage at which it´s necessary to disconnect the battery is markedly dependent on a discharge current (at a higher current it falls down). That´s why it´s good to set a deep discharge protection in respect to a supposed maximum discharge current. 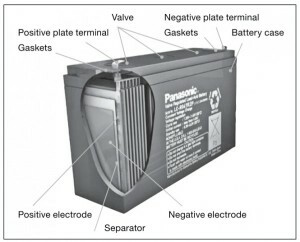 Above mentioned values apply to standard Panasonic batteries. In the offer of company Panasonic can also be found types with extra long lifetime as well as sa called „Power“ types, suitable for high current devices (UPS,…). On stock we keep a few selected types of Panasonic batteries and upon request, we´re able to provide you any other type. Detailed information about usage and an overview of the Panasonic portfolio can be found in the VRLA Handbook document. READ HDC1000 temperature and humidity sensor breakout, with Arduino library!